Spot-free, haze-free mirrors offer depth and pitch-black color only occurs in the better-struck Jeffersons! The reverse is a brilliant, pitch-black pool while the obverse holds the same pitch-black mirrors against a snow-white Jefferson! 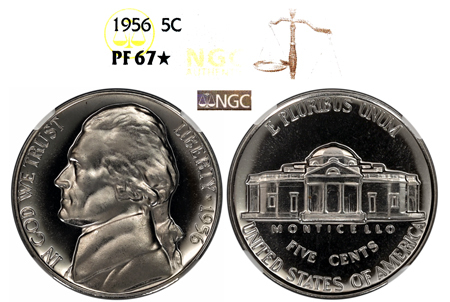 The obverse offers borderline Ultra Cameo contrast, which is incredible for a year that only has 313 TOTAL Jefferson examples certified in Cameo condition! This is 1 of only 46 examples graded, and offers superior quality for the date and grade!